It’s chocolate. And it’s a naked cake. 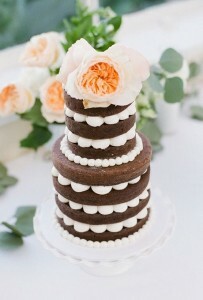 But look at the scalloped icing between the tiers. Good gravy that’s gorgeous! The cake is just two tiers, but they’re arranged in a way to make the cake look much bigger. The scalloped icing between each layer adds the perfect touch of elegance to the cake. And it’s so pretty that you need just one oversized fresh bloom to adorn the top of the cake. You should resolve to serve a cake this lovely at your reception this year. You’ll find this cake here. It was created by Enjoy Cupcakes.